This high-quality Ulysses S. Grant bobblehead from Royal Bobbles is a great gift for any collector. Made from heavyweight polyresin, this oversized piece celebrates this important President and Civil War hero. 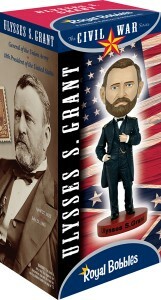 This piece comes in a colorful collectors box with historic details and facts about President Grant.